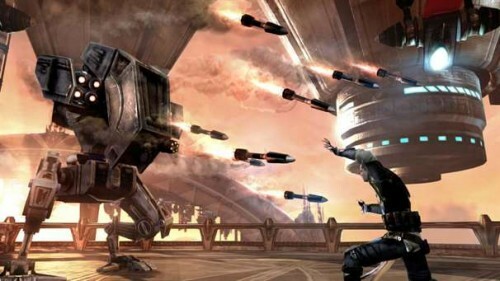 The catalog of video games based on the Star Wars franchise has touched every single genre, and with 2008’s The Force Unleashed, Star Wars had its God of War clone. Featuring an interesting story and a few new twists on the Force, LucasArts gave us a link between the Original Trilogy and the Prequels. That story apparently was not complete though, as we now have a sequel. If I wanted to, I could fill this review with a metric ton of Star Wars references, bad jokes, and awful puns. I won’t, but at the same time, I’m not going to go into it with an eye for catching everything that LucasArts gets wrong with the Star Wars Universe, unless they go horribly off script – like, you know, making the Force dependent on a bunch of bacteria – I won’t be pointing it out. Let’s review. So how do you make a sequel when the whole point of the first game is the heroic death of the main character? Starkiller’s sacrifice to save the fledgling rebels at the end of the first game was a decent ending, and didn’t leave much room for interpretation. However, with the magic of cloning, Darth Vader has gone about creating a whole new legion of Starkillers to do his bidding. Sadly, each of them are flawed, and he ends up cutting them down before they can help him overthrow the Emperor or root out the Alliance. The Starkiller that you will be playing as still has an emotional connection to Juno Eclipse, the Imperial pilot from the first game. Your search for her and the resulting consequences of that search provide most of the plot momentum. The game takes off with your escape, and goes… nowhere, really. By the end of the game, you’ll be treated to dozens of wonderful cutscenes full of dramatic things happening, but nothing really resolves. Once you get past the feelings of wonder at hacking through armies of Storm Troopers in the Star Wars universe, you see just how hollow this game really is. Further keeping this title from being great is just how short it is. I was critical of the first game because it stopped, turned you around, and started again with a second trip through all of the existing locations. That would have been nice to see here. Just when the story gets interesting, everything stops and sets up the third game in the trilogy. That’s bad form. You can decapitate and dismember enemies. Have a nice day, game of the year, no further contestants required. 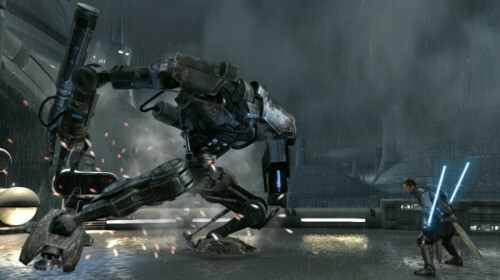 Kidding aside, this feels like a re-hash of the original Star Wars: The Force Unleashed. That isn’t a bad thing, because the first game had very good animations and a great color palette full of bright, shiny armor and glowing lightsabers. Now that LucasArts has had more time with the game engine, they’re starting to get a good feel for what they can do. The animations and attacks are flat-out amazing, particularly with the advent of the second saber. Your weapons flow from body to body, removing limbs and leaving glowing streaks on the floor and walls. It all looks amazing. There are some nice weather effects for some of the levels as well. Unfortunately, the walls and floor of a lot of this game are terribly bland. It goes beyond just flat textures – some of the levels looked like they were done in MS Paint. If flat and gray are your idea of a good time, this is your game. Fortunately, the amount of destruction you can cause to walls, terminals, and enemies is excessive, and you stop worrying about the fine details while you’re busy tossing dozens of people off skyscrapers with one hand while you electrocute their friends with the other. The cut-scenes are approaching Blizzard in their awesomeness, and that’s a great thing. In-game, however, the camera constantly needs adjusting and picks some terrible vantage points. Every time you get in an elevator or lift, the camera locks itself three inches from your ankle or shoulder, and stutters every time it loses pace with the lift. There also are a few inexcusable segments where the gameplay just stops and chugs for a few minutes. Having the Skywalker Sound team behind this game makes a huge impression. Every laser blast, every snap-hiss of a lightsaber, and the John Williams arrangements help make this game feel as authentic as possible. The voiceovers are mostly strong, with the high points being Yoda and Vader. Starkiller and the rest of his compatriots all sound either overly gruff or whiny, though some of that may be the fault of the script. In an early level, after being taunted by your target, Starkiller responds with “Shut up!”Â I was waiting to hear something about rubber and glue after that point. It just felt so lazy, so phoned in, especially when compared to the perfect sound effects. 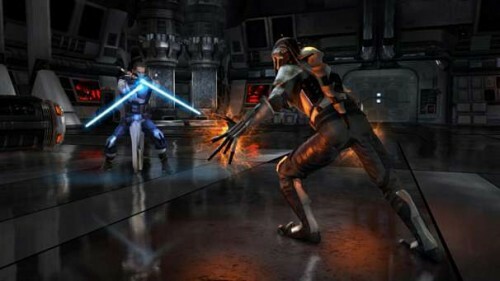 Even after extra time in development, Star Wars: The Force Unleashed II is the same game as the first. You can’t just add a second lightsaber and declare it to be something shiny and new. There are a few bright spots, such as the dive out of the cloning chamber in the first level, but ultimately this is the same game as last time. Use force powers to kill a prequel’s worth of Storm Troopers, fight a mini-boss until you can quick-time him to death, repeat. Starkiller’s powers are very satisfying to use, it’s just that they get old quickly. There’s also the permanently annoying camera and its tendency to focus on the wrong thing. In one section, I kept trying to jump up and Force-lightning an AT-ST, but instead my deadly energies kept washing harmlessly into empty air. There’s far too much sticking in the movement controls and aiming to call this a completely polished product. Some minor platforming elements exist, but they just feel tacked on to serve as breaks in the slaughter of troopers. The controls are solid enough to be fun, but the gameplay itself is painfully repetitive. In a single player game where much of the choices are either pared down or stripped away entirely, you won’t find much to convince you not to immediately yank this disc out of your system once you finish. There is the addition of Challenge Modes, which function exactly as you’d imagine them to: get higher ranks to unlock better awards. Are the awards that neat? No, not really. Because Starkiller is already phenomenally lethal, there is no reason to worry about power-ups either. You can play through twice and max out everything with points left over. Unless you have an incredible desire to beat this game on every difficulty level twice, you’ll find no joy in keeping TFU2 around. There are the requisite two endings, one Light side and one Dark side, but the game allows you to start from any major checkpoint, including right at the start of the final boss battle. When I look back at the amount of troops that Starkiller has laid waste to over this pair of games, I kind of wonder why the Empire was ever a threat to the Alliance. You aren’t just slashing through Storm Troopers, you are crushing and tossing aside TIE Fighters like they were paper. The balance in this game has been completely skewed in favor of massive destruction and a pair of flashing lightsaber blades. Sure, I’ll accept that if you’re wielding a pair of weapons that are designed to magically cut through anything that they touch then you shouldn’t have a problem hacking people up. And since we can go ahead and assume that every Force-user in the galaxy can bat away blaster fire the way you or I would swat at flies, you very quickly realize that Starkiller isn’t going to be bothered with the chaff. That ends up making the game infuriating. If there is no threat, then there is no drama. Can the enemy shooting at you from a distance not see the mound of bodies in your wake? Starkiller is a walking massacre, and I have no idea why any sentient being wouldn’t turn and run upon seeing him. Even the mini-boss fights can be laughed off with some minor planning. I’m not sure if this serves the story or is just bad design. It’s fun, but it’s eventually almost grim. Starkiller’s journey starts out with an escape from a medical facility. Sound familiar? That’s exactly what you did at the halfway point of the first game. If you’re already copying the first game in the first level, there’s a problem. 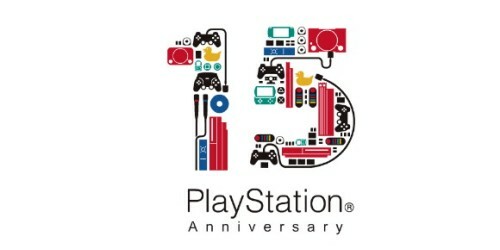 Adding to the trouble is the fact that this series has already more than earned the “It’s like God of War, but…”Â stamp. Starkiller is a palette swap and change in music away from being any number of action titles out there, from Ninja Gaiden to Darksiders. TFU2 tries too hard to keep appealing to Star Wars fans by populating the game with a pair of favorite Original Trilogy characters, but they don’t do much more than extend an over-wrought game anyway. Meeting Yoda and Boba Fett should be inspiring moments, not boring. Yoda barely even speaks to you. Starkiller walks up to him, smiles, steps into a cave, and leaves. It’s not a Dagobah level, it’s a Dagobah load-screen. There is a strong appeal to playing this game, a pull to see what’s next. Unfortunately, you end up beating it that way all too quickly. The game is around five hours long if you don’t play the challenges, and that’s with some boss fights that are tough to figure out at first. That aside, the game is mostly easy and once you get past the occasional tedium of swatting away another platoon of enemies, things move quickly. You want to get to the next cutscene, you want to see the next piece of drama and the next effect that Starkiller will have on this stage. It’s just too bad that you finish it so soon. The charm in this game wears off so quickly, and it really wastes the Star Wars setting. Where the first game had you going to a few planets and seeing different things and killing different people, the sequel uses the same group of enemies you killed in the first level over and over again. You visit Cato Neimodia, home of those “We swear we aren’t Asian stereotypes”Â Neimodians from The Phantom Menace, but the only enemies you’ll be killing on that planet are Storm Troopers. Then it’s into a medical frigate, where you’ll be killing – guess what – Storm Troopers. 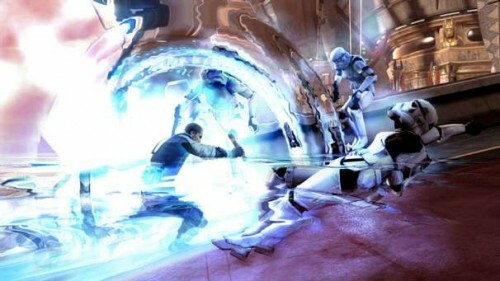 After that, it’s back to Kamino where you can finally fight those clone creators from the second prequel. Just kidding, you’ll be killing Storm Troopers again. Lucasarts didn’t even phone this one in, they sent a text message. I’ve touched on the game length and the lack of variety already, but I want to go back to that for a moment. 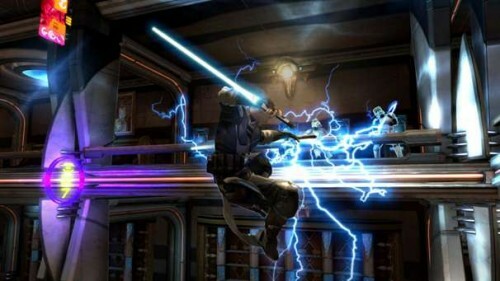 Star Wars: The Force Unleashed featured nine missions. Yes, three of them were re-hash missions after you had broken Vader’s hold on your mind. 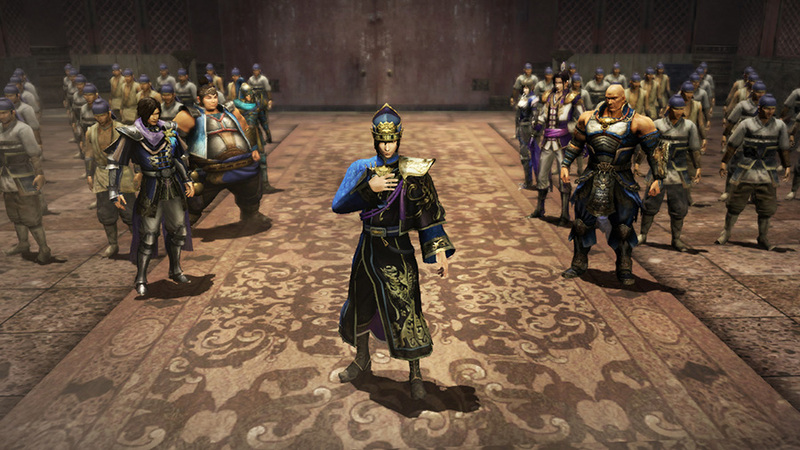 Still, there were seven different locations featured in the game prior to DLC. 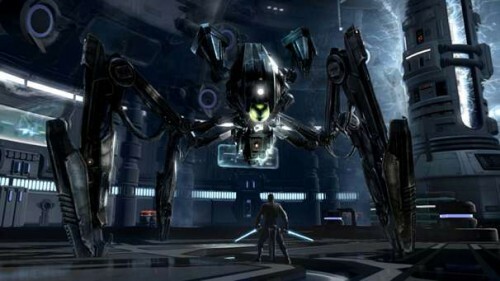 By contrast, The Force Unleashed II features three. I’m not counting the Dagobah mission because it was pathetically short. You walked about a hundred yards from one cutscene to the next. There are hints of other levels that may have been cut out, and I’m wondering why. Was it pressure to release the game in the holiday season? Was it a lack of interest during development? Budget cuts? Regardless of what caused this game to be given the short shrift, it hurts the finished product. Giving a guy two lightsabers and expecting that to make up for a lot of missing content does not work. With a never-ending stream of same-ness, Star Wars: The Force Unleashed II fails to impress in every way that really matters. This could have been a twenty-dollar expansion pack for the first game instead of a full-priced release. There is evidence that a lot more was planned in this game and that it just never materialized. Everything feels like it is a rehash of the first game, but at least they still managed to improve on, well… they added a second saber. That’s it. 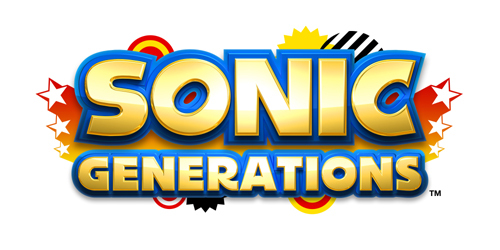 Sure, the graphics and sound are good, but they had better be with the pedigree that this title has. Everything you do in this game feels hollow and meaningless, and you there aren’t even any neat twists like there were in the first game. If you absolutely love Star Wars, you’ll feel cheated by the brush-offs and lack of attention paid to classic characters. Save the money and play the first one again.